For this project we took the empty shell of an old barn and created a thoroughly modern living space. 1. 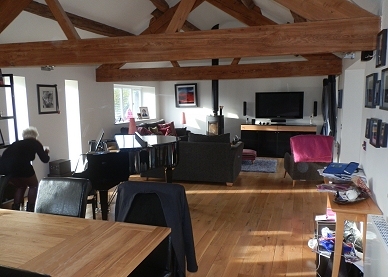 Barn conversion - Glossop. Where appropriate original materials were retained and enhanced – essentially the oak roof timbers. Those in poor shape where spliced with new wood by our highly skilled joiners with the repairs indiscernible from the originals. They were then professionally cleaned and treated bringing out their natural beauty. New services – gas, electricity and water were installed in the barn. A new concrete base for the floor was laid, the walls freshly plastered, and central heating installed. The barn is essentially a large bright open plan space – but clever design means that distinctly separate spaces are created without the loss of the sense of space. 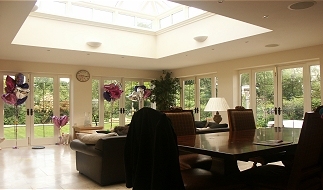 There is a living area, dining area and kitchen. A series of 'floor-to-ceiling' glass panels separate the kitchen from the dining and living area. 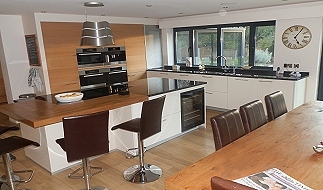 The kitchen is simply stunning – combining the very best appliances with the very best materials. 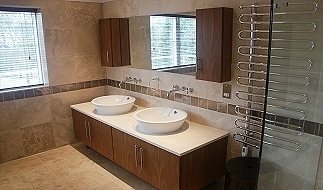 The worktops are Silestone, a high-end product of 94% natural quartz and is unique in incorporating Bacteriostatic Protection. The living area has a wood burning stove – giving extra warmth and cosiness on those long winter nights.